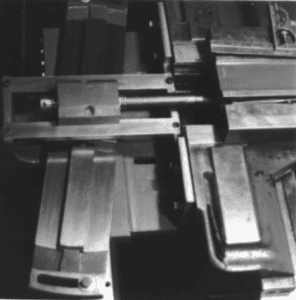 As there are innumerable variations in the design and construction of engine lathes, it is evident that no one accessory can be made to fit them all. Consequently, only very general instructions can be given for taper attachment installation, and these may have to be modified somewhat to fit various situations. This particular taper attachment is designed primarily for use with a telescoping cross slide screw, but it can be used with the regular non-telescoping type screw, though not without considerable inconvenience. First, determine if you have a telescoping cross slide screw. If there is no cross slide screw anchor block or bearing on the rear of the lathe saddle, you almost certainly have a lathe with a solid type screw, in which case it will need to be modified if it is to be used as a telescoping screw. If when the screw anchor block is removed, the screw seems free to slide when the cross slide is pushed or pulled, then your screw is telescoping. If the cross slide stays stationary and the screw seems to move you have a telescoping screw. Next, bolt the taper attachment to the rear of the saddle in such a position that the cross slide screw would, if it were longer, pass directly through the center of the screw anchor block. This is the part which the machinist holds in his left hand in Figure C.
Drill the mounting holes a little oversize so that the taper attachment can be leveled accurately with the saddle using a pair of vernier calipers or a depth micrometer as shown in Figure A.
Scribe around the end of the cross slide screw or otherwise locate a point to drill a hole in the anchor block as shown in Figure B. 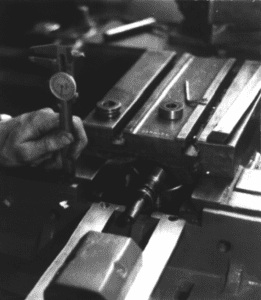 If you prefer, or conditions require, you may elect to drill the hole in the anchor block first, and then bolt the taper attachment to the lathe in such a position that the hole lines up with the cross slide screw. 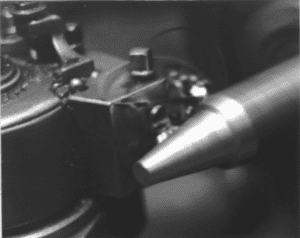 After the taper attachment is leveled, put in a couple of taper pins to prevent it from ever-shifting, and to facilitate the reinstallation of the taper attachment if the lathe should ever need to be disassembled. After locating the point for the hole to be drilled in the screw anchor block, remove it from the taper attachment in the manner shown in Fig. C. Drill the hole to the diameter of the end of the telescoping screw, or to some other suitable size that you determine. You may want to make it slightly oversize if you have made any errors in finding the point to be drilled. You may also wish to counterbore the hole on both ends to protect the thrust bearings, but this is not a must. The cross slide screw now has to be anchored to the screw anchor block (Fig. B). This entails making an extension for the screw if it is already the telescoping type, and in addition, making the screw to telescope if it is not the telescoping type. In either case, it is necessary to understand how a telescoping screw works. A telescoping screw is designed to function with a taper attachment, but when there is no taper attachment present, the screw must be anchored to a block or bearing plate of some sort located on the back side of the saddle. The other end of the screw has a keyway milled in it. This end fits into a mating hole at the end of the crossfeed handle shaft (Fig. C) and is driven by a key when the crossfeed handle is turned. Sometimes splines replace the key and keyways. When the taper attachment is in use, the screw is free to slide in and out of this hole. It may be well worth the effort expended to find and disassemble a lathe with a telescoping screw in order to gain a thorough understanding of the workings of this type of mechanism. If you have a regular type screw and wish to alter it, you must cut it in two at a point three to five inches in front of the power feed pinion as shown in Diagram A. Drill a hole in the unthreaded portion of the screw at point B to a depth of a least 4½ inches, and of a diameter small enough to leave a wall thickness of a least one eighth of an inch. Mill a slot in the side of this part of the screw one to three inches long by 3/16 inches wide. Note Diagram B. Next, take a piece of round stock the diameter of the hole you drilled, and cut it to a length 1½ to 2 inches longer than the depth of that hole. Mill a 3/16 inch keyway in the side of this shaft, then turn one end down and thread it, and screw it into a hole you have drilled and tapered in the cut end of the threaded portion of the screw. Secure the threads with a roll pin, taper pin, lead solder, or some other means to keep them from coming unscrewed during use. 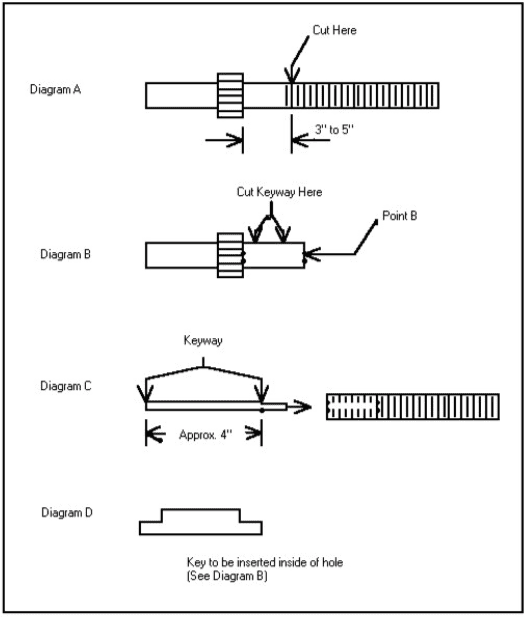 When this is done you should have about 4 inches of keyed shaft extending from the threaded part of the screw as shown in Diagram C. This end will slide in the hole drilled in the handle end of the screw, and may be driven by either a T-shaped key inserted from the inside, as is pictured in Diagram D, or it may be driven by a piece of conventional keystock that has been arc-welded into the slot from the outside. Now that you have a telescoping screw, you will have to build an extension to attach the screw to the anchor block on the taper attachment as shown in Figure D. One end of a piece of suitably sized round stock is turned down to a diameter and length such that it will pass through the hole drilled in the screw anchor block, and still have space enough for a thrust bearing or washer on each end, and a self-locking nut to hold the assembly together. The other end of the extension is threaded onto the end of the cross slide screw itself, and pinned to keep it from coming unscrewed in use. 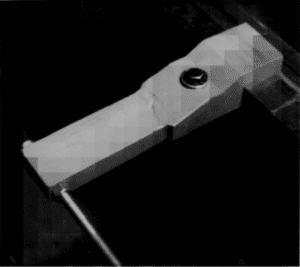 Figure E shows this pin hole being drilled. The length of the extension must be such that the screw is not restricted in its telescoping action when the taper attachment is in use. This is best measured when the screw anchor block is positioned midway between the two extremes of its telescoping action. The idea is to prevent the screw from either bottoming in the splined or keyed hole in which it slides on the handle end, or from sliding clear out in the other direction, thereby becoming disengaged from the cross slide handle. After it is reassembled, it should look similar to Fig. F.
The next step is to make a clamp to attach the bottom slide to the ways when the taper attachment is in use. Because there are so many different bedway configurations, this clamp must be manufactured on the premises. Often it is easiest to construct the clamp from three or four pieces. 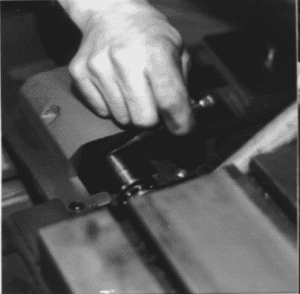 First, a piece is milled to fit the ways, and a hole is drilled in it so that a clamping strap might be bolted to it. 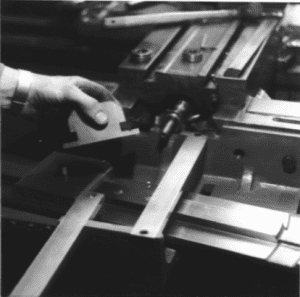 Then a three-inch section of round stock is drilled lengthwise to ½ inch. This sleeve is now bolted to the 1/2″ X 13″ tapped hole in the end of the bottom slide. A fourth piece of steel is measured and cut to fit the space between this sleeve and the part that is clamped to the ways. Cut it off and tack it in place with an arc welder, taking care to cover the ways so that the welding splatter will not cause any damage. (Fig. D) Remove the whole assembly and finish welding it together. Grind it and paint it and it is finished. Fig. G shows a clamp similarly constructed using only three pieces. When the installation is complete, you will need to make a mark on the bottom slide at each end to correspond to the calibrations on the top slide. This is done by using a dial indicator to find zero degrees of taper. 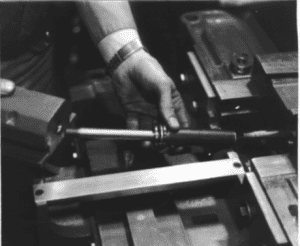 Put a mandrel in the lathe, holding it between centers, so that it will measure any movement of the cross slide relative to this mandrel. Now, adjust the taper attachment so that the indicator shows no movement when the (Fig. E) saddle is moved lengthwise. (The clamp must be fastened to the ways and the bottom slide while this is being done, just as if you were cutting a taper.) When you have found zero degrees of taper, make a mark on both ends of the bottom slide to correspond with the zero marks on the top slide. If you should desire to use the taper attachment without altering the regular type screw, you will have to make some kind of link to attach the screw anchor block to the cross slide when the pater attachment is in use. You will have to bolt this directly to the top of the screw anchor block. When this type of arrangement (Fig. F) is used, the crossfeed nut must be disconnected from the cross slide, thereby rendering it impossible to move the cross slide with the crossfeed handle. The compound is now your only adjustment. Needless to say, this is no small inconvenience. For this reason, we strongly recommend that you take the time to alter your cross slide screw if it is not already the telescoping type. If you have done everything correctly, you are now ready to use your taper attachment. Fig. H. shows a taper of over 4 5/8 inches per foot being cut with the taper attachment pictured. Please oil your taper attachment before each use, do not abuse it and it will give you years of excellent service. Need help with any of your machining manufacturing projects? We’d love to help. Give us a call or fill out a contact form here.